Thermal unit consisting of a self-supporting frame with a cataphoresis treatment and coating protection, with casing in treated steel to increase outside resistance. The casing features an internal 20 mm thick stiferite insulation covered with an aluminium film. - condensation discharge manifold for draining of a single thermal element. - minimum water pressure switch. Total modulation both in heating and hot water mode (For external DHW application only). 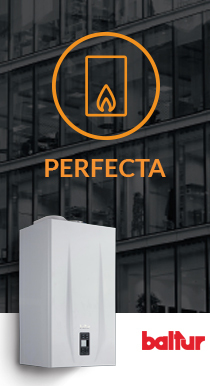 Ultra-high thermal performance (4 stars 92/42 EEC). NOx class 5 emissions (according to EN 483:1999). - thermometer with control trap; - fuel shut-off valve (optional).